Joe West's crew naming Kyle Knepper an honorary umpire in St. Louis is one of many instances of charity amongst the Major League men in black and blue. West's crew poses with honorary ump Kyle. 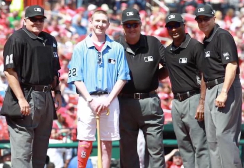 Knepper, an aspiring umpire since a young age, lost his right leg in a car crash and underwent a series of surgeries and rehabilitation, regaining the ability to stand thanks to a prothetic. As Cardinals Insider tells it, "Veteran umpire Joe West heard about Kyle's journey. He had Kyle become the honorary umpire for a game against the Reds. This was a dream made real for Kyle." Explained Kyle, "I'm working as hard as I can to get back [to umpiring] as soon as possible. Getting on the field: All I care about is getting on the field this summer." 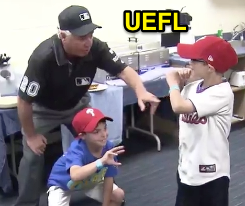 It's all part of umpires in the community, and most recently saw Tom Hallion's crew host a selection of young Phillies fans in conjunction with Casey Cares, a Mid-Atlantic organization that provides uplifting programs for families with critically ill children. Hallion demonstrates the plate umpire's job. Hallion's hosting duties were supported by UMPS CARE Charities, founded by Major League umpires and whose staff still features retired umpire Gary Darling as President, Marvin Hudson as Vice President, Jim Reynolds as Secretary, and Chris Guccione, Adrian Johnson, Tim Timmons, Jim Wolf, Umpire Supervisor Larry Young, and even Ump-Attire/Score 451 Sports' Jim Kirk as At-Large members of the Board of Directors. UMPS CARE's activities range from in-Stadium tours to hospital visits, ticket donations, charity golf tournaments, auctions, and scholarship programs. Find out more about UMPS CARE Charities at http://www.umpscare.com | Videos via "Read More"